We are reminded of Ben Graham’s Mr. Market analogy. In his analogy, the stock market is like having a business partner (Mr. Market) who offers to either buy or sell his half of the business to you, based on how the business is doing. When times are rough, he sets a very low price because he is afraid you will dump the whole thing on him. When times are good, he sets a very high price because he is afraid you’ll will buy the other half away from him. Mr. Market volunteers to set the price each day, just like the stock market does, but you don’t have to act on it. WBA: Walgreens Boots Alliance Inc., CMCSA: Comcast Corp., KR: Kroger Co., AXP: American Express Co.
For the same money that Mr. Market demands to buy the entire Amazon Corporation, you can buy a basket of twelve companies we own. We chose the list based on companies which are being treated very poorly by Mr. Market because of the “existential threat” coming from technology companies, placed in the retail, grocery, media, pharmacy and healthcare industries. These companies have met our eight criteria for common stock selection, which means they have measurable qualities that have historically led to durability and future success. We like them even though Mr. Market doesn’t. "It is occasionally possible for a tortoise, content to assimilate proven insights of his best predecessors, to outrun hares that seek originality or don’t wish to be left out of some crowd folly that ignores the best work of the past. This happens as the tortoise stumbles on some particularly effective way to apply the best previous work, or simply avoids standard calamities. We try more to profit from always remembering the obvious than from grasping the esoteric. It is remarkable how much long-term advantage people like us have gotten by trying to be consistently not stupid, instead of trying to be very intelligent." Lastly, our best way of thinking about this investment contrast is imagining that we were the wealthiest person on earth and we could afford an investment of $740 billion. 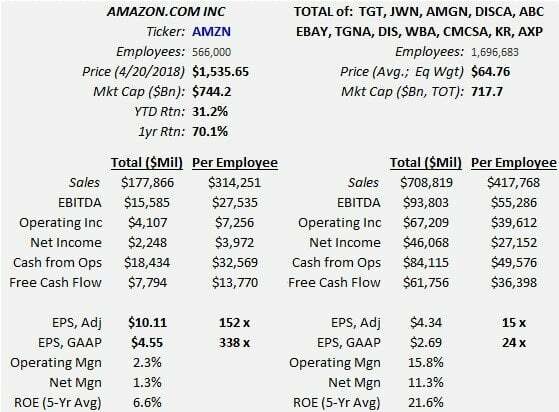 Would we buy the whole company called Amazon or would it be obvious to us to buy the other 12 companies which fit our eight criteria for close to the same amount? The information contained in this missive represents Smead Capital Management's opinions, and should not be construed as personalized or individualized investment advice and are subject to change. Past performance is no guarantee of future results. Bill Smead, CIO and CEO, wrote this article. It should not be assumed that investing in any securities mentioned above will or will not be profitable. Portfolio composition is subject to change at any time and references to specific securities, industries and sectors in this letter are not recommendations to purchase or sell any particular security. Current and future portfolio holdings are subject to risk. In preparing this document, SCM has relied upon and assumed, without independent verification, the accuracy and completeness of all information available from public sources. A list of all recommendations made by Smead Capital Management within the past twelve-month period is available upon request. ©2018 Smead Capital Management, Inc. All rights reserved.